In the second installment of this blog series, I addressed two major testing approaches. In this segment, I cover how to ensure the correct environment for optimal exposure. Studies should be done in a temperature-controlled environment. This is readily achieved in modern photostability chambers, and most laboratories have the equipment necessary to achieve and maintain a set temperature even if a specifically designed photostability chamber is not available. Exposure is likely to take several days based on the equipment used. Samples may be tested as solids or in solution. Samples that are gels or creams may be spread in a transparent container as a 3 mm or less thick band. It’s important to select a container that is truly transparent to all light at the wavelengths of interest for the study, since any filtration at important wavelengths will influence the outcome. The main concern is to get the correct level of exposure, which only takes place at the surface layer for solids, creams and gels. Samples are coupled with light-protected controls, samples wrapped in foil or otherwise protected from the light source in use. The purpose is to control for environmental influences other than the light exposure, such as temperature and humidity. For laboratories, another consideration is photostability of the product during testing. Some drugs are photostable in the dosage form, but once diluted during test preparation become light sensitive. Such preparations may require low-actinic glassware and protection against ambient environmental light sources while the tests are being performed. For this reason, photostability is often included as a part of method development. 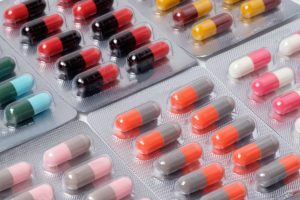 Drugs can be damaged by many routes in the environment, and protecting from damage caused by exposure to light can extend the shelf life of the product and yield safe, longer lasting and effective treatment for the patient. The first step to protecting a product from light exposure is to establish a comprehensive testing approach through well designed photostability studies.